Shopping for crib bedding can be one of the most enjoyable parts of preparing for a new baby. Your baby will spend a lot of time in the first days sleeping. We looked at the 15 most popular crib sheets on the market and considered them for materials used in manufacturing, color choices, pattern styles, size options, durability, comfort and customer feedback. The three crib sheet choices reviewed below were at the top of the list of crib sheets we looked at in all of the categories we considered. Any one of them would make a great crib sheet for your child. As much as 18 hours each day. You want their sleeping space, their crib, to be soothing, comfortable, and appealing. It doesn’t have to cost a ton of money to achieve this comfortable and soothing space for them. There is a large selection of crib sheets on the market. You can choose from different patterns, colors, materials and sizes. With all of these options it could feel overwhelming to try and find the best crib sheets for your baby’s needs. When you have the right information, choosing the right crib sheets for your baby becomes much easier and can actually be fun. Bedding sets look very appealing with all of their colors and styles but many of the bedding sets on the market include items that are not safe for your baby and should really be avoided. A good example is a bumper pad. They look wonderful but they are a suffocation hazard, especially for young babies and should be avoided. When looking for bedding for your baby, concentrate on the crib sheets only and don’t worry about the items that have been linked to unsafe accidents. Magnolia provides parents with colorful and comfortable crib sheets that are made from 100% organic cotton that has been weaved into a fabric that is soft and thick and comfortable for your little one. The bright, colorful patterns will entertain the baby and look great in the nursery as well. The patterns and colors are made from eco friendly pigments that have been independently certified to Global Organic Textile Standards including all the packaging as well. Each sheet measures 28” x 52” x 9” and fits all standard crib mattresses. Each crib sheet has a thread count of 300 and is made from a sateen material that feels great to the touch so your baby is kept comfortable. The sheets are packaged in a reusable accessories bag that is made from organic cotton also. These are great sheets that will enable you to make a comfortable and soothing bed for your baby. The super soft microfiber fabric used for these sheets by Where the Polka Dots Roam is a luxury, brushed microfiber that provides the ultimate in comfort for your baby. 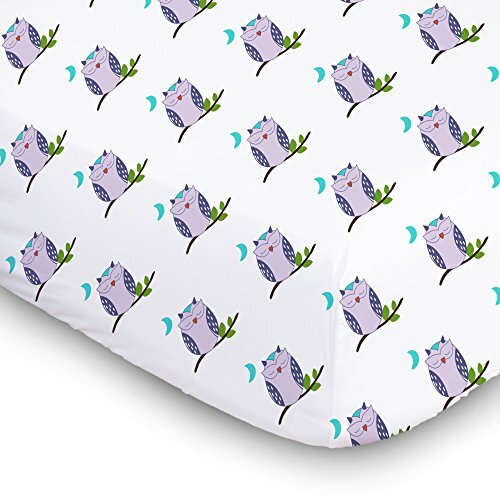 The design of these sheets is super cute and will delight parents and babies alike. 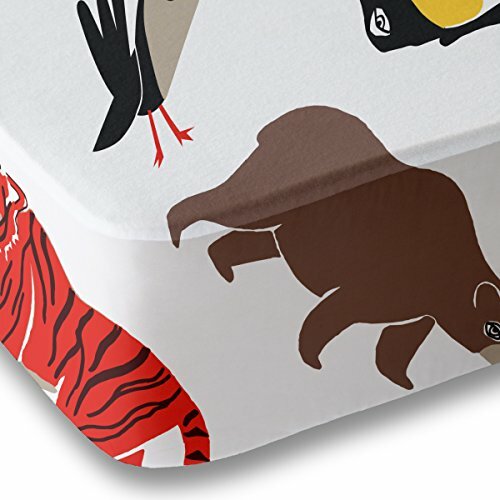 The brightly colored animals on the sheet would be the perfect accent to a zoo themed nursery. The sheets are very easy to take care of; just machine wash and tumble dry and they are good as new. The sheets will not wrinkle, shrink, ball up or cause fit problems even after they have been used for years. Their durability is one of their best features. You won’t have to worry about the corners of the crib sheet slipping off the mattress because these sheets fit a standard 52” mattress well. The sheets are as soft as a 1500 thread count sheet would be which makes them incredibly comfortable for the baby to sleep on, staying warm in the winter and cool in the summer. These sheets come with a 100% money back guarantee, no questions asked. Pretty Baby brings you the softest and most comfortable crib sheets available with these colorful muslin cotton sheets. One of the benefits to using muslin sheets is that every time you wash them, they get softer. The sheets are made from 100% Muslin Cotton and are very breathable to keep baby comfortable as well as being hypoallergenic. The corners of these brightly colored crib sheets have very deep, 9” pockets that the baby mattress fits into securely so the sheet doesn’t slide off. These sheets are designed to fit the standard 52” crib mattress and along with the deep pockets, you will have a smooth, problem free fit. The Pretty Baby Muslin sheets are easily cleaned by tossing into the washing machine and washing in warm water with other colors that are similar. The cute, bright prints work well for boys and girls and will help you create a fun and cheery bed for your little one. One feature of the Pretty Baby Muslin sheets is that they are warm in the winter and cool in the summertime. This guarantees that your baby will be comfortable all year round. These crib sheets are available in a variety of colors that are perfect for boys or girls. They make excellent baby shower gifts or new baby gifts. 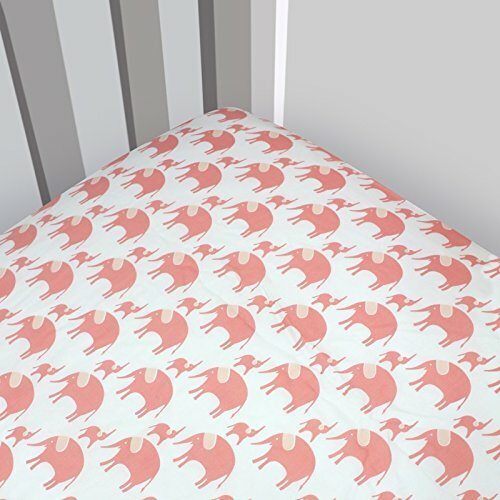 There are hundreds of different styles of crib sheets on the market. There are also a few different types of materials that crib sheets are made of. Sorting through all the styles, colors, patterns and materials can feel like a huge challenge but with the right information you won’t feel so lost. The three top rated crib sheets featured above are all excellent choices for crib sheets for your baby. They are made with comfortable, ultra soft materials and have bright, happy prints that your baby will love. With each of these choices, the sheets get softer and more comfortable the more you wash and dry them. Read the buyer’s guide below to learn more about choosing the right crib sheets for your baby’s nursery. There is some important information in the guide that will make it much easier to make a good decision on crib sheets that will be safe, comfortable and soothing for your baby so he or she gets a great night’s sleep. There are a number of different kinds of crib sheets available to choose from. It isn’t always easy to tell the differences between crib sheets. Sometimes they may be made of the same type of material but the weave is different and that gives them a different feel. We’ve listed the different kinds of crib sheets that are readily available as well as the benefits and disadvantages of each type. Cotton Crib Sheets – Pure cotton is a very breathable fabric that is popular for many different items including crib sheets. The breathability allows air circulation all around your baby which means the sheets will be cool in the summer and warm in the winter. Another benefit to cotton crib sheets is that they are hypoallergenic. This makes them a great choice if your baby has allergies or is prone to skin rashes from different substances. Cotton doesn’t get lint buildup or pile like other fabrics can and it is very easy to wash. They are prone to wrinkling and can either be ironed or steamed before use or you can put them on the crib mattress and just wait for the wrinkles to disappear gradually. Even if the sheets are a little stiff when first taken out of the package, they will soften up after a few washes and continue to soften as they are washed and dried each time. Muslin is a type of cotton that is used to make cheaper crib sheets. It can sometimes be more expensive than regular cotton. It is available in different grades but overall is not as superior as normal weaves of cotton are. Organic cotton is also available for parents that don’t want their babies sleeping on anything that contains chemicals of any kind. One disadvantage to the cheaper grades of cotton is that they may shrink during the washing/drying process. Polyester Crib Sheets – Polyester is associated with inferior quality but this is not the case anymore. With all of the technological advancements that have been made in the textile industry, polyester is much higher quality than it used to be and it can be woven in many different ways. S Microfiber and satin crib sheets are actually 100% polyester but both have been weaved a special way that makes them not only durable but extremely comfortable too. Crib sheets that are made from 100% polyester are less expensive than cotton crib sheets. Thanks to the flexibility of the fibers of polyester, these sheets are typically tear resistant under normal wear and tear. They do have a tendency to pill but the higher quality bands are long lasting. Due to the lack of breathability of polyester, these sheets tend to be better for use during the winter months or an air conditioned room that is kept cooler. Due to the quality of polyester being less reliable, look at reviews before purchasing a set of polyester crib sheets to see how that particular brand is performing. Flannel Crib Sheets – If you live in a climate that has several cooler months, you will definitely want to purchase flannel crib sheets for those cooler months. They trap the heat in and help your baby feel very toasty even in cold weather. This will help them sleep through the night rather than waking up cold. Flannel crib sheets can be made from a variety of materials including wool, cotton, synthetic fibers or a combination of materials. Flannel crib sheets have a slightly raised surface called a nap that makes them fuzzy and soft to the touch. A flannel sheet is graded for quality by ounces and not threads. A high quality flannel crib sheet will typically have a rating of 6 ounces per yard or something similar. Flannel crib sheets are less likely to shrink than other materials. They are available in a variety of styles. They are usually coarser than cotton and muslin crib sheets and have a bad habit of pilling. It is not recommended to use flannel crib sheets in the summertime as this can overheat the baby too much and cause excessive sweating. Alternate Natural Fiber Crib Sheets – While cotton is the most common natural fiber used for crib sheets, companies have begun to offer natural fiber crib sheets in other fibers such as bamboo. It is the most popular type of alternative fabric that is being used to appeal to eco-friendly parents. Unfortunately, most alternative fiber sheets wear very quickly and are not as durable or comfortable as the real cotton fiber sheets are. The best natural sheets to purchase as the ones made from organic cotton which has many of the same benefits that regular cotton does including being all natural, environmentally friendly and in many cases, depending on the brand, they are hypoallergenic too. They do tend to be a lot less soft or comfortable and don’t last as long as cotton sheets do. Crib sheets can be purchased as part of a crib bedding set but this is something that is being discouraged due to the fact that the crib sets contain things in them that are not good for a newborn or even an older baby. Even though crib bumpers look pretty, they are actually a suffocation hazard and the bed is much safer for your baby without it. There are studies that have been done that indicate a reduced risk of SIDS when crib bumpers are not used. Another problem with the crib bedding set is that cheaper materials are often used to keep costs down. You are much better purchasing crib sheets and other bedding as separate pieces to ensure that you are getting the quality you want. Crib sheets are always getting messed up for one reason or another. Spit up, diaper accidents, and other things can cause a sheet to get dirty. Having plenty of good quality crib sheets will enable you to always have a clean place for your baby to sleep. It is always a good idea to keep at least half a dozen crib sheets in stock if not more. You can choose a variety of designs and colors if you choose to give the baby something new to look at but you should try to keep the quality and materials consistent with the exception of purchasing flannels sheets that you can use during the winter time. In general, the higher thread count a crib sheet has the heavier and softer the sheets will be. Thread count is important if you want to purchase good quality crib sheets that will be soft and comfortable for your baby. We’ve listed a simple guideline for thread count that might help you understand it better. Do not purchase crib sheets with less than 200 thread count. Crib sheets are an important purchase that every new parent has to make. With all of the different styles, designs, colors, patterns, materials and sizes, purchasing the right ones can be a challenge if you don’t know what you’re looking for. The purpose of this guide is to give you the information you need to make the right decisions. With this information you will be able to look at the different crib sheet offerings on the market and sort through them to purchase several crib sheets for your baby that will provide them with comfort and style every time they lay down to go to sleep.